The Freewell Gear-produced Parrot Anafi Bright Day Filter Kit is the perfect accessory for professional aerial cinematographers. It is an excellent solution for capturing crystal-clear and sharp aerial footage, especially in bright sunlight. 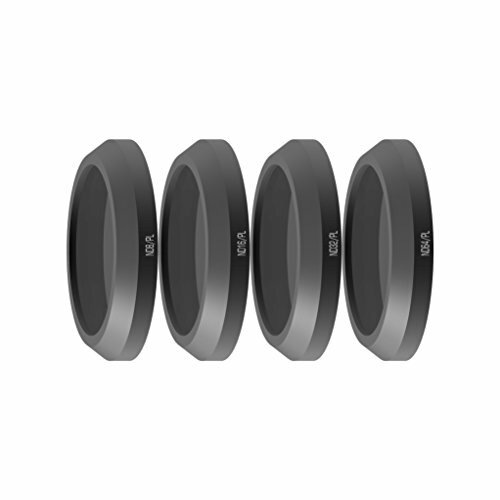 The filter kit contains 4 (FOUR) hybrid (ND/PL) camera lens filters designed exclusively to fit the Parrot Anafi camera. The ND (Neutral Density) factorin the hybrid filters works perfectly to reduce shutter speed by 2x f-stops through restricting the amount of light entering the lens in gradual stops. On the other hand, the PL (Polarizing Lens) factor in the filter helps to remove any unwanted reflections from your picture, thus ensuring sharper and clearer images at all times. Easy SNAP-ON feature for faster installation. Designed for use with - Parrot Anafi Drone. If you have any questions about this product by Freewell, contact us by completing and submitting the form below. If you are looking for a specif part number, please include it with your message. Polaroid Optics 52mm HD Multi-Coated Variable Range (ND3, ND6, ND9, ND16, ND32, ND400) Neutral Density (ND) Fader Filter - 6 Filters in 1!